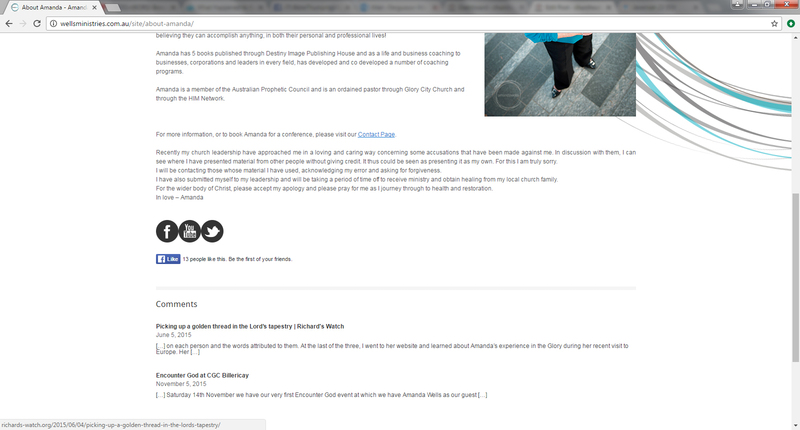 We came across what appears to be a feeble attempt of you making an “apology.” It wasn’t too hard to find as it was hidden in plain sight at the very bottom of your wellsministries.com.au website. “Recently my church leadership have approached me in a loving and caring way concerning some accusations that have been made against me. In discussion with them, I can see where I have presented material from other people without giving credit. It thus could be seen as presenting it as my own. For this I am truly sorry. I will be contacting those whose material I have used, acknowledging my error and asking for forgiveness. I have also submitted myself to my leadership and will be taking a period of time off to receive ministry and obtain healing from my local church family. For the wider body of Christ, please accept my apology and please pray for me as I journey through to health and restoration. It was added as though it were nothing more than a mere afterthought. It’s not highlighted or italicized, neither is it at the very top and center as it should be. And even if you did take the time and effort to appear to make it of utmost importance, it’s still not an authentic sign that you are truly repentant of your sins. You see, Amanda Wells, not only are you guilty of profiteering off people’s work in the name of God, you have demonized your critics and CONTINUED to plagiarize people’s works in the name of God to line your pockets even AFTER being called out publicly for engaging in illegal activities. then your “apology” is NOT accepted. 1. You are making a mockery of God and His Word. We as Christians are to love God and love our neighbors as ourselves. Instead, you HATE God by twisting His Words to suit your own passions and you HATE your neighbors by stealing from them, lying to them, mocking them, and even worse, sending those who follow you to Hell with your false doctrine. 2. God’s Word commands Christians to silence those who are “teaching for shameful gain what they ought not to teach (Titus 1:10-11). We are to publicly rebuke those who “persist in sin… so that the rest may stand in fear” (1 Timothy 5:19-20). We are also called to “purge the evil person” who is within the Church (1 Cor 5:11-13). This behaviour brings shame on the body of Christ and makes Christianity looks like a joke to the unbelievers. Why would anyone want to become a Christian when charlatans like you are masquerading as “pastors”, preying on, and spiritually abusing the congregants who attend their churches? 4. We want to address your “apology.” If you were really sorry, you would be publicly repenting of falsely speaking on God’s behalf, twisting God’s Word for selfish financial gain, leading your followers to Hell with your false doctrine, plagiarizing from others, and turning Christianity into a joke. The Concerned Christians who contacted you last year gave you a very concise list of everything you should be doing to bear fruit in keeping with repentance. 1. Publicly announce that you have plagiarised the work of Lance Wallnau and many other people across the internet. 2. Publicly apologize for claiming direct revelation from God and tell everyone you are NOT a prophet. 3. Publicly announce that you will refund everyone who has bought your books, work-books, and merchandise because you have lied and cheated them for financial gain. You must do this, even if means paying off people for the rest of your life. 4. Refrain from speaking at the Australian Prophetic Summit. This list seems quite reasonable conceding the brevity of your sins. Source: Amanda Wells, About Amanda, Wells Ministries, http://wellsministries.com.au/site/about-amanda/, Accessed 17/11/2016. ‹ Modern Restoration of Apostles? What The NAR Really Teaches.